Now everyone can buy just the amount they need and the baking decoration products are well presented. 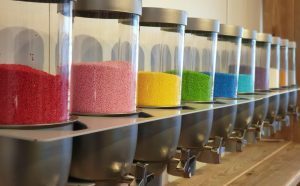 The bulk food market is growing and more and more clients contact Food Dispense to work together on various bulk food concepts for nuts, muesli, superfoods, chocolates, sweets, toppings, fitness powders, tea, coffee beans, etc. Our clients are retailers, food service companies and brands looking for successful, attractive presentations that are well received by consumers. Among our clients are Dr Oetker, Basic Bio, Cloetta candy, Arla, etc. 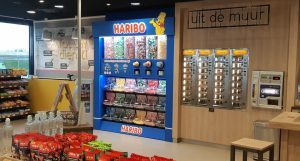 The past years unpackaged shops appeared in big cities throughout Europe and especially in Germany new shops have been initiated. Even supermarkets more often choose unpackaged displays or shelfs. Early adopters have known it for years. 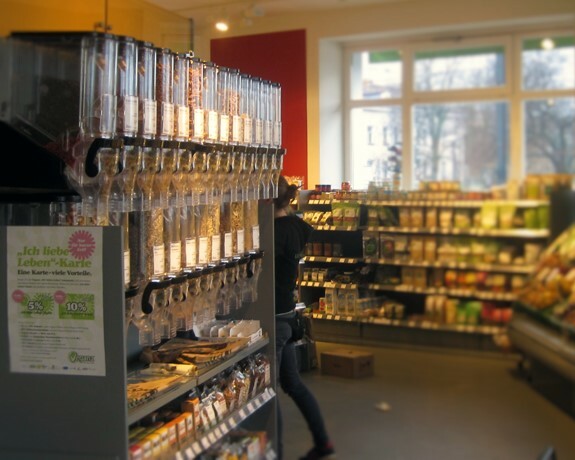 Unpackaged shopping is a trend and Food Dispense gives you five reasons why. A term that is used more often: plastic footprint. Introduced by organisations, like the plastic soup foundation. The floating garbage dump in the north of the oceans gets a lot of attention nowadays. Who does not know the pictures of birds with belly’s full of plastic? A massive awareness and strive to produce less (plastic) waste is growing. Unpackaged shopping is a simple way to contribute. Separation of (plastic) garbage has increased the past few years. The government has taken action and we all became more active. A good cause, but with a downside. In Europe a home has an average of 3 to 6 garbage cans. They take a lot of space and cause other grieves, like bad smell. Separation of waste is time consuming and complex. 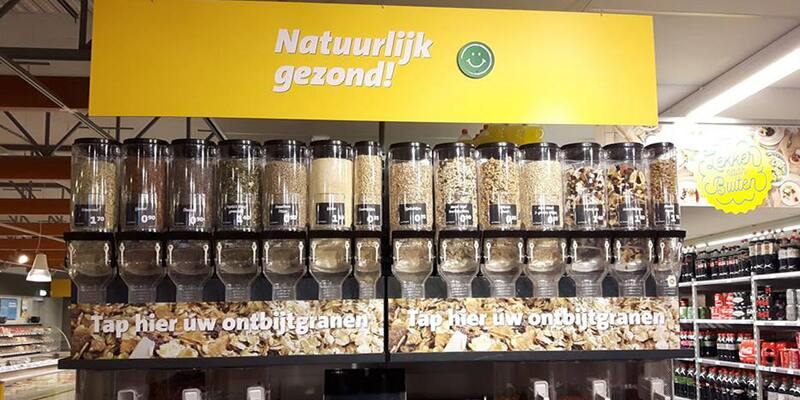 It make sense that we want less waste and unpackaged shopping becomes more attractive. Since the beginning of this year shop owners in Holland are not allowed to give free bags to customers. The customers can pay for it or take their own bag. Research shows that 8 out of 10 Dutchmen take their own bag now. Before an average of 3 milliard plastic bags passed the counter. After this success less package in the shops is a next step. Do you remember when you were a little kid and you were allowed to scoop candies at the local druggist? Imagine you can grab and weigh all your groceries yourself? Unpackaged shopping is not only ethical responsible, but also fun and easy. You choose the exact amount of the product and only buy what you need. You want customers to walk through your entire store to make sure they see all the products. Put the best selling products or the most essentials ones, like dairies, in the back of your store. Create a supermarket design with a right atmosphere. Things that smell good, like bread and flowers should be at the beginning of the store to attract customers. The colours of fresh fruit and vegetables will create a happy feeling and you want customers to enter the store with a good feeling. Such an obvious one, but it still works. Place nice goodies and snacks at the checkout. Chocolate bars and candy are often bought as an impulse while waiting in line. We think that these could also be replaced by healthy snacks, like nuts or cereal bars. 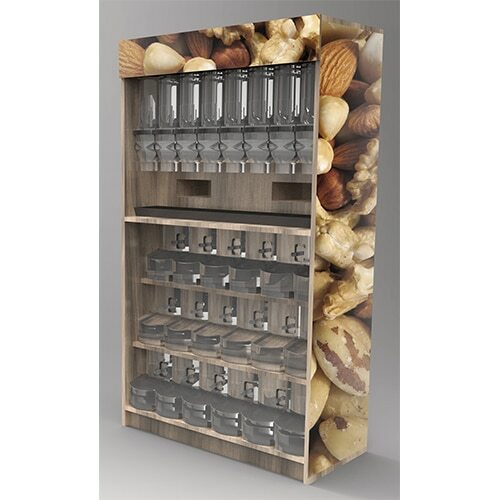 Have you ever considered a self-dispenser counter or wall to sell candy, nuts, coffee, tea, cereals or any other dry goods? The advantages of self-dispensing are multiple. They have a great and luxurious look and feel and guarantee the first in, first out principle. Customer can get just the amount they need and you save packaging. Last but not least you can buy a large amount of the product and increase margins. Naturally the puppy is fed by his mother, but he gets the first dry or fresh dog food from the breeder. New owners often continue to give this. After all a breeder knows best what kind of nutrition works for a certain kind of breed. Especially first time dog owners take advice from a breeder. A place where you can get information about dog food is the pet store. This advice is seen as reliable. Dog owners visit the pet store often and are happy to choose a product that is available nearby. Pet guardians are looking for information on the internet. Especially if they have to switch nutrition because the dog does not like the food or gets an allergy or other grieves. Forums and informative websites are being consulted before choosing a new product. Like with other products we choose brands that we heard of before or we choose a brand that is known by friends or family. Word of mouth marketing surely goes for pet food. Awareness and trust are important when choosing dog nutrition. Really? Yes, some dogs choose their own food. Simply by rejecting the food that is presented and eating the option they do like. Some bosses even put a few options on the floor and let their dog friend decide. We like this idea! What do think of a dog food display? A place where dogs can choose their favourite snacks and dry foods. Which kind of tea is consumed most often? Do you know the famous saying: “If you are cold, tea will warm you. If you are too heated, tea will cool you. If you are depressed, tea will cheer you. If you are exited, tea will calm you”? We agree! Tea can be enjoyed at every moment of the day. We have done a little research on the popularity of this drink. Which kind of tea is most popular worldwide? We ask tea lovers and this is what they say. Herbal tea is popular and especially mint tea. A refreshing cup of tea with health benefits. It improves digestion and reduces nausea and vomiting. Fresh or Moroccan mint, with a bit of green tea, unsweetened or with some honey. Mint tea is an absolute favourite. It looks great, especially in a long glass. Pure or flavoured with jasmine, citron, cranberries or ginger. Green tea is consumed in a hundred different ways. Besides its great taste it is also popular because it is claimed to support weight loss. But for this you should drink a few cups a day over a longer period of time. Green tea is best made with water of 80 degrees, otherwise it gets bitter. Just like green tea and oolong, black tea is made of the leaves of Camellia sinesis, but with another oxidation and higher caffeine level. Black tea keeps its taste longer. Ninety procent of the tea sold in the West is black tea. Think about English breakfast, Ceylon, Darjeeling and flavoured tea like strawberry, tropical fruits and lemon. A positive benefit from black tea is that is contains flavonoids that decrease the risk of strokes, high cholesterol and heart diseases. 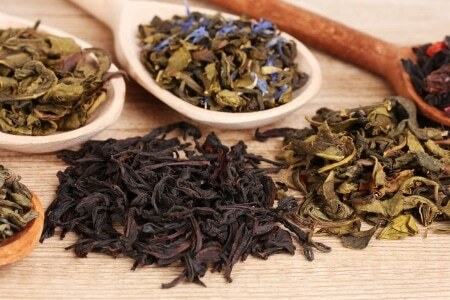 Two black teas are often mentioned by tea lovers. Here they are. Black tea with oil of bergamot, a small citrus tree which blossoms during the winter . Early Grey has a strong smell and great taste. Named after (earl) Charles Grey (1764-1845), a British (prime) minister. Known since 1820, but still popular. Nowadays made of bergamot and green tea or oolong as well. Some love it, some hate it. But it seems that the lovers are a majority. In a few countries the word for tea is ‘chai’, but here we refer to the spicy drink from India. Black tea with spices like cinnamon, ginger, pepper, cardamom and clove. Tastes great with milk and/or honey. A spicy drink and because of that a good substitute for coffee. How do you present you tea? Have you ever considered presenting your tea in dispensers? The dispensers of Food Dispense are made of UV blocking bin material that reduces the oxidation of oils to maintain the integrity of the tea. Our bins are contoured and smooth – ideally designed to avoid build-up of residue from specialty teas. Tight fitting lids ensure the freshness of your product. Are you considering opening an unpackaged store? We would love to help you! Here are six do’s that get you started. Talk to people who have opened a similar store. Have a good thought about the finance and how much you need to exist for three years, because this is the period a start-up normally needs to be successful. Can you lend money from family, friends, the bank? Otherwise start a crowdfunding. That is a good way to create engagement with future customers. Make sure you have the right competences in your team. Your internal and external organization needs to be in place. Think about stock, suppliers for bulk delivery, employees, decoration, promotions, commercials. Furthermore you must arrange permits and consider things like hygiene, fire safety and shelf life. Be careful when choosing your location. This is the most important thing in retail. Know that a “save packaging” concept does not attract everyone to come to your store and consider a location that is already visited by potential customers. A shop in shop concept would be a good idea. Negotiate the prize and make sure you have an escape option. Investigate the best period for opening, set the date and hold on to this date. Start promotion before opening and communicate about your drive and mission. Give special attention to social media and online presence. Involve your customers and let them help when putting together the assortment and service. Make sure the store’s neighbourhood is aware of the opening. Keep track of your customers and surprise them regularly with promotions, attractive deals or please consider a loyalty program. What kind of dispenser are you looking for: a push/pull dispenser, elephant dispenser or a standard one? Have you ever considered a large food dispenser? It looks great in your store and it can give an exact amount of the product the customer wants. 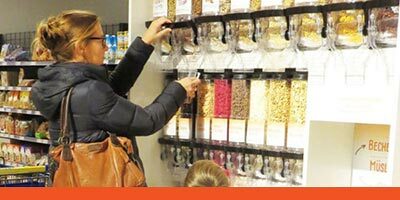 This is why every supermarket or food store can benefit from a large food dispenser. A wall of candy, nuts or cereals is a very impressive thing to see. The large food dispensers fill the wall and make an outstanding presentation of the product. Especially when a large area is filled with a colourful product. 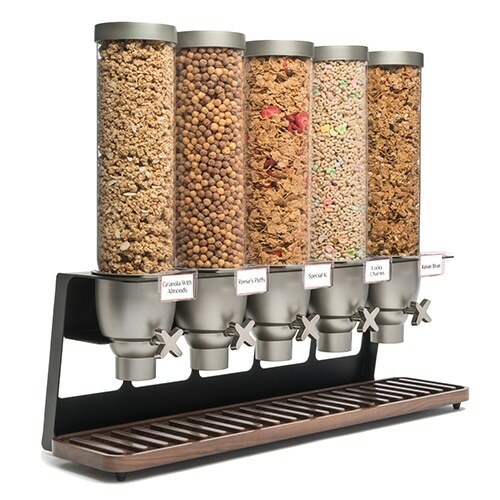 When you place several large food dispensers next to each other and put different variants of the product in the dispensers your customers can pick and mix and get a mix of jelly beans, nuts or cereals. Big tubes give small portions. This way the customer can get exact the amount he needs. Even the largest food dispensers can give a precise portion. You do not want to fill up your dispensers ten times a day? The usage of a big tube is a great and easy way to present your bulk and fast selling products. This way you do not have to fill up the dispensers several times a day. You use the height of your store and this helps when you do not have a lot of surface. Here are some customers who are using big tubes. 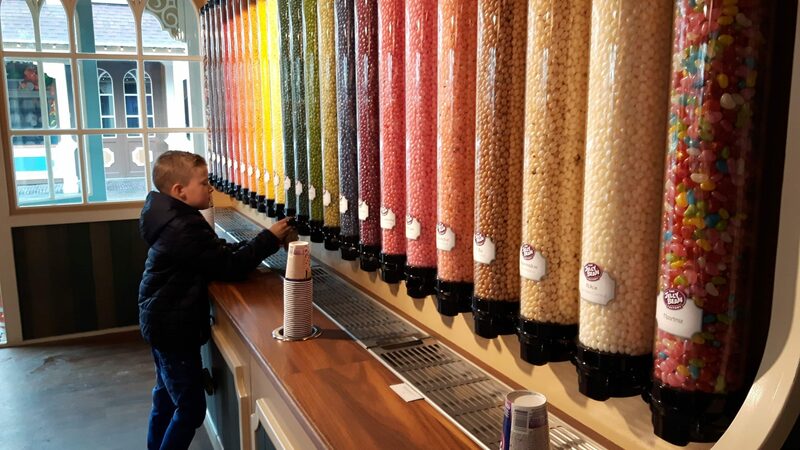 Supermarket AH XL in the Netherlands created a jelly bean wall with dispensers from Food Dispense.